The Juki MCS-1500 is the perfect addition to any serious seamstress’ sewing room. Performing both chain and thread cover stitches, this machine will make your garments look professional while improving the integrity of your seams. Is the MCS-1500 a good fit for you? Let’s see what this machine has to offer. Juki’s MCS-1500 is a specialized machine that uses three needles and performs both chain and thread cover stitches. With the MCS-1500, your projects will look and feel more professional. Juki is a highly respected brand in the industry, and this machine offers simple features that every user will appreciate. Chain stitches are great for the waist and side seams of pants. The lower thread creates a chain on the wrong side of the fabric, making the stitch extra-strong when it stretches. It’s also great for decorative stitching along the neckline. Thread cover stitches are versatile and great for all-around use. From hems to necklines and sleeve cuffs, the cover stitch can be used for most projects. The machine offers a 4-thread cover stitch, 3-thread cover stitch (narrow) and 3-thread cover stitch (wide). The MC-1500’s presser foot is higher at the tip, which makes it easy to insert the fabric when you get started with sewing. The presser foot can also be raised to 8mm and 10mm, so you can insert thicker fabrics with ease. The machine’s looper is easy to thread and can be lowered with just the touch of a button. The MC-1500 has an adjustable differential feed, so you can sew stunning finishes. This feature even works well with stretchy fabrics, like knits. The adjustable feed feature makes it easy to work with a variety of fabrics, and is so easy to use. The machine’s extension plate includes helpful seam guidelines. These guides will help you sew straight stitches and make your projects look more professional. Juki is all about giving users more control over their sewing experience. With the MC-1500, you can even adjust the presser foot pressure to fit the type of fabric you’re working with. This feature will help you avoid bunching and stretching when using specialty fabrics. One feature that’s often overlooked and underappreciated is the thread cutter. Exterior thread cutters make it so much easier to finish your stitch and get on with your day. The MC-1500 has its own thread cutter that makes it easy to finish after lifting the presser foot. To further help you create the perfect stitch, the MC-1500 has a helpful presser foot guide. The guide presses down on both the right and left sides, and comes as a standard accessory. Coupled with the seam guide on the extension plate, this machine will help you create straight stitches. Like the Janome coverstitch we reviewed earlier, the MC-1500 has just the right number of features, and it sews like a dream. The thread looper is so easy to thread. It’s lowered with just the push of a button. 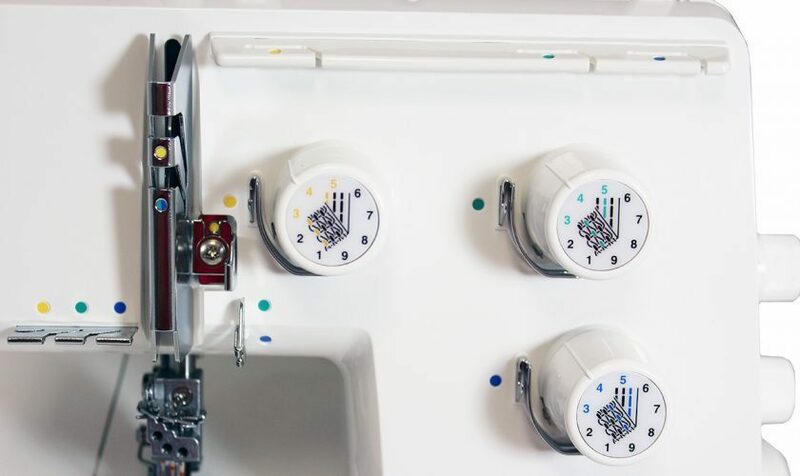 There’s a color-coded guide on the machine that makes threading a breeze. The machine has three needles, but it can perform both three- and four-stitch options. You can use this machine for hems, necklines, sleeve cuffs and pant seams. The chain stitch is great for those vulnerable areas that get stretched out when you put them on. One thing that surprised us about this machine is its speed. The MC-1500 can sew up to 1,350 stitches per minute. It’s one of the fastest coverstitch machines around, which makes everyone’s life easier. You’ll be surprised by how quickly you finish projects with this zippy machine. We also really like the thread cutter feature. Most models have the cutter on the side of the machine, but the MC-1500 cuts the thread as soon as you lift the presser foot. The presser foot also lifts high – up to 10mm – so you can work with thicker fabric or multiple layers of fabric. The machine’s user manual is very thorough and includes detailed information on how to thread the machine (complete with an illustrated guide). You’ll also find out how to use a sewing test to make sure the machine is working properly. It also includes a complete guide on how to use the stitches, and a troubleshooting chart to help you tackle any issues that might come up when using the machine. Juki also backs this machine with a 2-year electrical warranty, 5-year mechanical warranty and 90-day adjustments warranty. It’s difficult to find anything to complain about with this machine. It sews like a dream, it’s easy to work with, and it’s the type of machine that you know will last. One thing I will say is that this machine is not as robust as a serging machine. However, it will still bring your sewing projects to the next level. But honestly, there isn’t a whole lot to complain about with the MC-1500. This a well-built machine that does what it’s supposed to do. It can work with a wide range of fabrics, and it even has guides to help you sew straighter stitches. If you’re looking for a cover stitch machine that’s easy to work with and produces consistent results, the MC-1500 is a great option. When paired with a serging machine, you can produce runway-ready garments right from your own home. And this machine is still lightweight and compact enough that you can take it with you on the go. Thanks for the this awesome review…I’ve been leaning towards this machine, but so many people by the Brother coverstitch machine, I was doubting myself.